The Series Twilight fans are binge-reading now! The highly anticipated conclusion of the series is here! Everything is chaos in Robyn’s life. Her dad is still missing. Amy is gone, taken. Jazmine is still in a coma, and they’re getting ready to shut her off. Robyn’s mom and grandmother have left the house and are in hiding with Duncan. Robyn is all alone, but at least she has Jayden.…Or does she? More secrets will be revealed as Robyn closes in on the killer and we finally get the answer to who he really is. Meanwhile, the neighborhood has begun its preparations for the upcoming Halloween Block Party. Are you ready to return to Shadow Hills? Don’t miss out on the epic ending to an astonishing series. CHAOS AND COURAGE is the 10th and last book in a fun and frightening romantic paranormal mysteries. If you like star-crossed chemistry, headstrong heroines, and riveting family drama, then you’ll love Willow Rose’s heart-throbbing series. 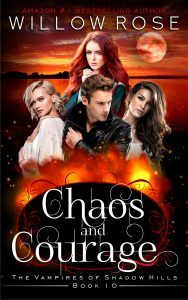 Buy CHAOS AND COURAGE to discover how it all the loose ends ties up in a mind-blowing grand finale.